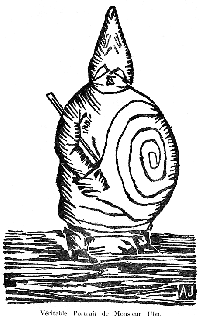 Ubu Roi (1896) is a play written and staged by Alfred Jarry, a widely acknowledged precursor to the Absurdist, Dada and Surrealist art movements. The death of the avant-garde coincides with the death of modernism. Charles Jencks noted in The Language of Post-Modern Architecture that "Modern architecture died in St. Louis, Missouri on July 15, 1972 at 3:32 pm when the infamous Pruitt–Igoe scheme, or rather several of its slab blocks, were given the final coup de grâce by dynamite." Avant-garde is a French phrase used to refer to people or actions that are "ahead of their time", novel or experimental, particularly with respect to the arts and culture. Avant-garde in French was first used in the military sense from the 15th until the 18th century, meaning front guard, advance guard, or vanguard. The first time the term avant-garde in an art context was attested was in France in 1825 in the text "The Artist, the Scientist and the Industrialist" by the French utopian Olinde Rodrigues, but it was only in the 20th century that the first self-proclaimed avant-garde movements arose, giving the term its current meaning of pioneers or innovators in an artistic sense. In the 1960s the term avant-garde reached an early peak but was since then joined by the terms experimental and underground, albeit with slightly different connotations. Towards the the mid to late 20th century, critics announced the death of the avant-garde. The history of avant-garde avant la lettre started with the Quarrel of the Ancients and the Moderns, a quarrel that heated up in the late 17th century, shaking the Académie française. It opposed the Ancients, who supported the merits of the ancient writers and contended that a writer could do no better than imitate the great examples that had been fixed for all time and the Moderns, who supported the merits of contemporary authors. The history of the term avant-garde is described in Five Faces of Modernity (1977|1987) by Romanian scholar Matei Calinescu. The vanguard, a small troop of highly skilled soldiers, explores the terrain ahead of a large advancing army and plots a course for the army to follow. This concept is applied to the work done by small bands of intellectuals and artists as they open pathways through new cultural or political terrain for society to follow. Due to implied meanings stemming from the military terminology, some people feel the avant-garde implies elitism, especially when used to describe cultural movements. This term also disagrees with the thoughts of many people. The origin of the application of this French term to art is still debated. Some fix it on May 17, 1863, the opening of the Salon des Refusés in Paris, organised by painters whose work was rejected for the annual Paris Salon of officially sanctioned academic art. Salons des Refusés were held in 1863, 1874, 1875, and 1886. The term also refer to the promotion of radical social reforms, the aims of its various movements presented in public declarations called manifestos. 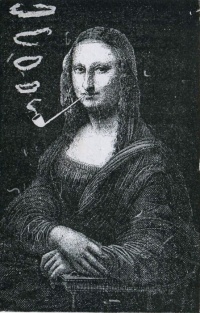 It was this meaning evoked by the Saint Simonian Olinde Rodrigues in his essay "L'artiste, le savant et l'industriel" (1825) which contains the first recorded use of "avant-garde" in its now-customary sense: there, Rodrigues calls on artists to "serve as [the people's] avant-garde," insisting that "the power of the arts is indeed the most immediate and fastest way" to social, political, and economic reform. Over time, avant-garde became associated with movements concerned with art for art's sake, focusing primarily on expanding the frontiers of aesthetic experience, rather than with wider social reform. For instance, whereas Marcel Duchamp's fountain (a urinal), which he declared a piece of art, may have been avant-garde at the time, but if someone created it again today it would not be avant-garde, because it has already been done. Avant-garde is therefore temporal and relates to the process of art's unfolding in time. Duchamp's work retains its distinction as avant-garde even today, because it marks a historical point in the advancement of the conception of art, relative to the period in which it surfaced. Similarly, "avant-garde" can be applied to the forerunners of any new movements. The sculpture also can be understood purely in formal terms. It's all white color and sensual curves are apparent. The material is vitreous, smooth, uniform. The curvature of the surface is gentle. The artist specified the orientation at which the object is to be displayed -- rotated 90 degrees from the orientation in which it would normally be encountered. The new orientation places the object's center of gravity lower to the ground. In this new orientation the curvature of the defining edges form a teardrop shape, from the vantage point of the viewer. This new orientation of the object is a choice and an innovation of the artist. While it is a found object, it is not just any found object. The artist's will and the artist's choices are reflected in this sculpture. The choice of this particular object as opposed to some other found object is a reflection of the volition of the artist. The aesthetics of the object, even on their most superficial level, cannot be ruled out as conscious and willful choices made by the artist. Several writers have attempted to map the parameters of avant-garde activity with limited success, although one of the most useful and respected analysis of vanguardism as a cultural phenomenon remains the Italian essayist Renato Poggioli's book Teoria dell'arte d'avanguardia (1962). 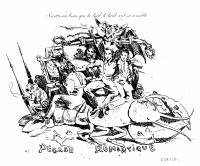 Surveying the historical, social, psychological and philosophical aspects of vanguardism, Poggioli reaches beyond individual instances of art, poetry and music to show that vanguardists may be seen as sharing certain ideals or values which are manifested in the non-conformist lifestyles they adopted, vanguard culture being shown to be a variety or subcategory of Bohemianism. Reflecting on Baudelaire’s complaint that ‘the man of letters is the enemy of the world’ and Mallarmé’s distress over the isolation of the creator in ‘this society that will not let him live’, Poggioli identifies that beyond their non-conformist postures, avant-gardes have historically existed in a state of mutual antagonism towards both the public and tradition. As pioneers, avant-gardists have shunned popularity, seeing those who are popular as producing complacent or compromised work. This is also why avant-gardists have abhorred fashion, judging it to deal in stereotypes, falsehoods and insincere sentiments. So, on the one hand, their iconoclasm has witnessed vanguardists take positions against current trends; but as pioneers they will also adopt a strong ‘down-with-the-past’ attitude. Vanguardists are committed to the New, seeing traditions, institutions and orthodoxies as outmoded prisons of convention. Taken together, these traits mean that vanguardists are necessarily estranged from society. This has taken several forms: some creators were socially alienated, others felt culturally alienated, others still experienced a form of what Poggioli terms 'stylistic or aesthetic alienation'. It has been common for vanguardists to declare their opposition to the bourgeoisie, in particular, on any or all of these grounds. The vanguard’s antagonism towards accepted values and approaches has also meant that historically their audience has tended to be the Intelligentsia. Poggioli further tries to classify vanguardists according to four conceptual dispositions: Nihilism, Futurism, Decadence. Other authors have tried to both clarify and push further Poggioli's study, such as the German litterary critic Peter Bürger who published Theory of the Avant-Garde. While the title of Bürger's essay is an explicit reference to Poggioli's, he makes several useful additions to the latter's groundbreaking study, such as the distinction between "historical" (Futurism, Dada, Surrealism) and neo avant-garde (Abstract Expressionism, Pop Art, Nouveau Réalisme, Fluxus, etc.). The concept of avant-garde refers exclusively to marginalised artists, writers, composers and thinkers whose work is not only opposed to mainstream commercial values, but often has an abrasive social or political edge. Many writers, critics and theorists made assertions about vanguard culture during the formative years of modernism, although the initial definitive statement on the avant-garde was the essay Avant-Garde and Kitsch As the essay’s title suggests, Clement Greenberg conclusively showed not only that vanguard culture has historically been opposed to ‘high’ or ‘mainstream culture’, but that it also has rejected the artificially synthesized mass culture that has been produced by industrialization – the pervasive commercial culture of popular music, soap opera dramas, pulp fiction, magazine-illustration, and B movies. Each of these media is a direct product of Capitalism – they are all now respected Industries – and as such they are driven by the same profit-fixated motives of other sectors of manufacturing, not the ideals of true art. For Greenberg, these forms were therefore kitsch: they were phony, faked or mechanical culture, which often pretended to be more than they were by using formal devices stolen from advanced or vanguard culture. For instance, during the 1930s the advertising industry was quick to take visual mannerisms from surrealism, but this does not mean that 1930s advertising photographs are truly surreal. It was a matter of style without substance. In this sense Greenberg was at pains to distance true avant-garde creativity from the market-driven fashion change and superficial stylistic innovation that are sometimes used to claim privileged status for these manufactured forms of the new consumer culture. A similar view was likewise argued by assorted members of the Frankfurt School, including Theodor Adorno and Max Horkheimer in their essay The Culture Industry: Enlightenment as Mass-Deception (1944), and also Walter Benjamin in his highly influential The Work of Art in the Age of Technical Reproduction (1936). Where Greenberg used the German word kitsch to describe the antithesis of avant-garde culture, members of the Frankfurt School coined the term mass culture to indicate that this bogus culture is constantly being manufactured by a newly emerged Culture industry (comprising commercial publishing houses, the movie industry, the record industry, the electronic media). They also pointed out that the rise of this industry meant that artistic excellence was displaced by sales figures as a measure of worth: a novel, for example, was judged meritorious solely on whether it was a bestseller, music succumbed to ratings charts and the blunt commercial logic of the Gold disc. In this way the autonomous artistic merit so dear to the vanguardist was abandoned and sales increasingly became the measure, and justification, of everything. Consumer culture now ruled. Despite the central arguments of Greenberg, Adorno and others, the term ‘avant-garde’ has been appropriated and misapplied by various sectors of the culture industry since the 1960s, chiefly as a marketing tool to publicize popular music and commercial cinema. It is now common to describe successful rock musicians and celebrated film-makers as avant-garde, the very word having been stripped of its proper meaning. Noting this important conceptual shift, major contemporary theorists such as Matei Calinescu in Five Faces of Modernity: Modernism, Avant-garde, Decadence, Kitsch, Postmodernism (1987), and Hans Bertens in The Idea of the Postmodern: A History (1995), have suggested that this is a sign our culture has entered a new post-modern age, when the former modernist ways of thinking and behaving have been rendered redundant. Avant-garde in music may refer to certain forms of 20th century art music and to an extreme form of musical improvisation in which little or no regard is given by soloists to any underlying chord structure or rhythm, such as free jazz. The term is used loosely to describe the work of any musicians who radically depart from tradition altogether. By this definition, some avant-garde composers of the 20th century include Arnold Schoenberg, Charles Ives, Igor Stravinsky, Anton Webern, George Antheil (in his earliest works only), Alban Berg, Henry Cowell (in his earliest works), Philip Glass, John Cage, Morton Feldman, Richard Strauss (in his earliest work), Karlheinz Stockhausen, Edgard Varèse, and Iannis Xenakis. Although most avant-garde composers have been men, this is not exclusively the case. Women avant-gardists include Pauline Oliveros, Diamanda Galás, Meredith Monk, and Laurie Anderson. There is another definition of "Avant-gardism" that distinguishes it from "modernism": Peter Bürger, for example, says avant-gardism rejects the "institution of art" and challenges social and artistic values, and so necessarily involves political, social, and cultural factors. According to the composer and musicologist Larry Sitsky, modernist composers from the early 20th century who do not qualify as avant-gardists include Arnold Schoenberg, Anton Webern, and Igor Stravinsky; later modernist composers who do not fall into the category of avant-gardists include Milton Babbitt, György Ligeti, and Luciano Berio, since "their modernism was not conceived for the purpose of goading an audience." The Originality of the Avant-Garde, 1985, Rosalind E. Krauss. Unless indicated otherwise, the text in this article is either based on Wikipedia article "Avant-garde" or another language Wikipedia page thereof used under the terms of the GNU Free Documentation License; or on original research by Jahsonic and friends. See Art and Popular Culture's copyright notice. This page was last modified 13:33, 9 February 2015. This page has been accessed 62,752 times.